These fuzzy little cupcakes are happy candy for the eyes! 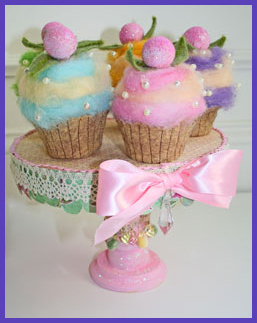 The tutorial will teach you how to make a charming cupcake centerpiece from wool roving and supplies you probably already have in your craft stash. The finished project is a fun conversation piece for your coffee table, a party, or a thoughtful housewarming gift for a friend. Click here to check out this great tutorial right here on Craftster! And click the image below to find even more free tutorials on SpottedCanary.com! thank you! I’ve always wanted to try this!